People tend to care about dogs because they generally have more experience with dogs as companions; but other animals are as capable of suffering as dogs are. Few people feel sympathy for rats. Yet rats are intelligent animals, and there can be no doubt that rats are capable of suffering and do suffer from countless painful experiments performed on them. If the army were to stop experiments on dogs and switch to rats instead, we should not be any less concerned. Today I am going to make a stand in defence of rats and mice who are probably the most neglected and abused animals of the planet. Fact - Did you know that rats are less likely than your cat or dog to catch and transmit parasites and viruses? In fact rats are very clean animals spending many hours each day grooming themselves and each other. Yet many people continue with the misconception that rats are the purveyors of disease and should be eradicated at all costs. Fact - Rats and mice make up about a fifth of all species of Mammals, rodents are more closely related to humans than are dogs, cats, horses, elephants, whales, dolphins, and every other order except nonhuman primates. But even people who would not countenance any mistreatment of squirrels, chipmunks, prairie dogs, or beavers will often kill rats and mice by horrendously cruel means, or look the other way while others do the killing, using glue-traps, bone-crushing spring traps, and an array of poisons which may not be legally used against other species. Why are we horrified when cats and dogs are the subjects of cruel experiment yet think its okay to harm rats and mice? There are so few people prepared to defend the rights of rats and mice as they do other animals, the exception being pet rats and mice who are usually white in colour rather than brown or grey, the colours of their undomesticated counterparts. It appears to me that of those of us dedicated to animal rights or animal welfare or whose of us who are vegetarian or vegan, few speak out against the cruel treatment of these rodents. Googling something along the lines of “do vegans care about rats and mice” and you will find little information in support of animal welfare or animal rights concerning rats and mice, few stand in defence of these rodents who are like any other mammal such as your cat, dog, rabbit or guinea pig - the last of which is of course a rodent. So far the only significant stand in defence of these animals is from the people for the Ethical Treatment of Animals PETA and even they actually condone euthanasia in certain circumstances. More about this further down. http://www.ehow.com/how_7682306_use-ultrasound-rid-rats.html - can't be used if you have pets. More humane rodent deterrent information further down. "However, most of these rodents are killed by poison- specifically 'anticoagulant' poisons. These are by most accounts extremely inhumane, and better methods are available. These poisons give the animal that eat them anything but a nice death. Rats and mice take an average of around 7 days to die after poisoning, and spend much of this time in severe pain. Anticoagulant poisons work by causing internal bleeding. They die paralysed and in pain, from blood loss and internal organ damage." "Rats are very social and affectionate animals. They love being in the company of their own species or humans. They like playing together and love to sleep curled up together. They take care of the injured and sick rats in their group. 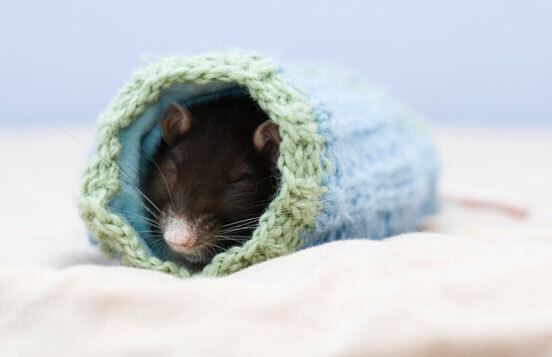 When rats don't have companionship, they can become lonely, depressed, anxious and stressed. Rats are intelligent animals. They are more intelligent than rabbits, hamsters, mice, gerbils and guinea pigs for instance. They also have excellent memories. Once rats learn a navigation route, they never forget it." In an expensive study of the obvious, psychologists at the Graduate Center for the City University of New York designed an experiment to see what effect stress would have on rats who drink alcohol. Of course, rats don’t drink, so first they had to get them used to drinking by mixing alcohol in their water. Though the researchers acknowledge that “alcoholics in treatment claim that life stressors are the leading cause of continued drinking or relapse,” they somehow justified spending taxpayer money to study whether stressed rats would drink more than non-stressed rats. Many people however - even those who care - are concerned when rats or mice encroach their lives. Like any other animal, a rat or mice may not be welcome - I didn't like cats in my yard because of our adopted rabbit , who is now no longer with us, who used to wander about the yard. Cats can attack a rabbit and so can rats, our rabbit Sooty was bitten by a rat. I would rather not have rats in the yard or mice if they got into the house as is possible as our back door was always open for our house rabbit to come and go as he pleased. Equally I would not want someone’s cat in our house either. This does not mean I lay traps or put down poison for the rats or mice any more than I would for the cat: the cat, the rat and the mouse are all living beings with the right to life as much as you or I or my rabbit. Glue traps and poisons are inhumane and cruel to the extreme as the unfortunate animals often spend days suffering before eventually dying in agony. 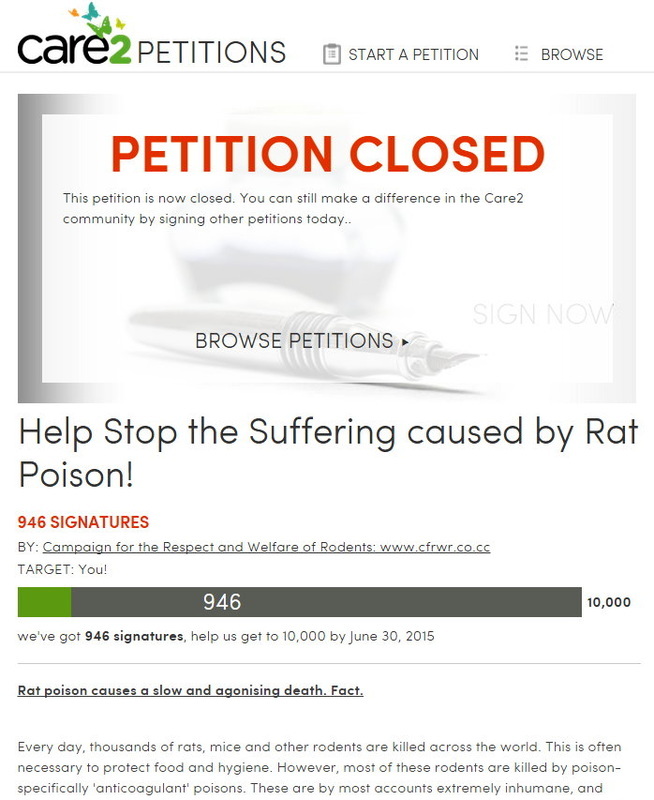 Rats and mice may not be the only victims as other small mammals get caught in traps or poisoned including wildlife, companion animals and even humans may also come to harm after contact with toxins as was indicated in the petition above. Furthermore these methods of eradication are in the long term futile not to forget the obvious that these animals have a right to live. Please continue reading the following for more information about how to humanely keep rats and mice out of your home, your garden yard or elsewhere. I am not sure what the odd advice included in the above link says about rock music, I guess rats can't stand it as much as I :-) Also unless you live in an isolated area I doubt the neighbours would appreciate music all day. Hold on just noticed in the above article - ("Rodents can also be humanely euthanized by a veterinarian or at a local animal shelter.") Apparently PETA condone killing a healthy animal! PETA it seems are not one hundred percent in their defence of the right of all animals to life. Shocked? I am indeed. It goes without saying, but I must be clear I do not condone euthanasia - killing - of any healthy living being unless it is in self-defence or the animal is seriously ill. The rest of the information is nevertheless sound and useful. The information is from PETA's USA website, the ideas though are much the same anywhere.